The tribal belly dance costume is wonderfully elaborate, and the hair and face aren't left out! Tribal fusion dancers, especially, go to town on their hair and make-up. In fact, the dancer's real hair is often not visible under all the flowers, feathers, braids, hair falls and scarves, and the face may be adorned with heavy eye make-up, tribal facial marks, or bindis. The end result looks fabulous but it takes a lot of work - and a lot of practice too! Sometimes the reason you can't see the bellydancer's hair, is because it's covered by a headdress, turban or artificial hair fall. Even if you're wearing a turban, it's usual to add some flowers, feathers or other ornaments. Let your imagination be your guide! Always rehearse with your full hair decoration at least once, to be sure nothing's going to fall off while you're dancing - apart from being embarrassing, fallen flowers and pins can be a danger to other dancers! Make sure you do your trial run with clean hair. I've seen dancers try out their hairdo successfully in class - then on performance day, watched their ornaments slide off because their freshly-washed hair was too soft and shiny. The clip below gives some tips on how to keep things secure, even on a loose hairstyle. Like all stage performers, strong eye make-up and lipstick are essential for your audience to see your features. Tribal dancers tend to favor smokey eyes, but do take your own eye shape into account - too much dark shadow can "close up" some eyes, and you don't want to look as though you're half asleep! When you're using a lot of eyeshadow and mascara, it's usually better to do your make-up back to front - eyes first, then foundation, for two reasons. One, eyeliner often takes more than one attempt to get right, and it's easier to sweep it off and try again if you're not trying to avoid removing your foundation. Two, eyeshadow and mascara can drop flakes on your cheeks and under your eyes, ruining your other make-up - so it's better to get the eyes right first, give your mascara time to dry and then apply foundation and concealer. 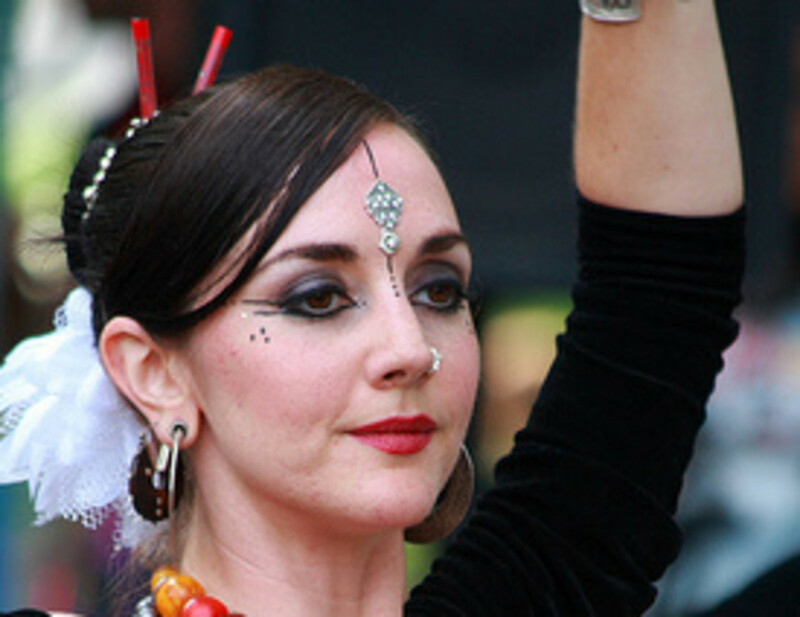 Tribal bellydancers don't limit themselves to decorating eyes and lips. 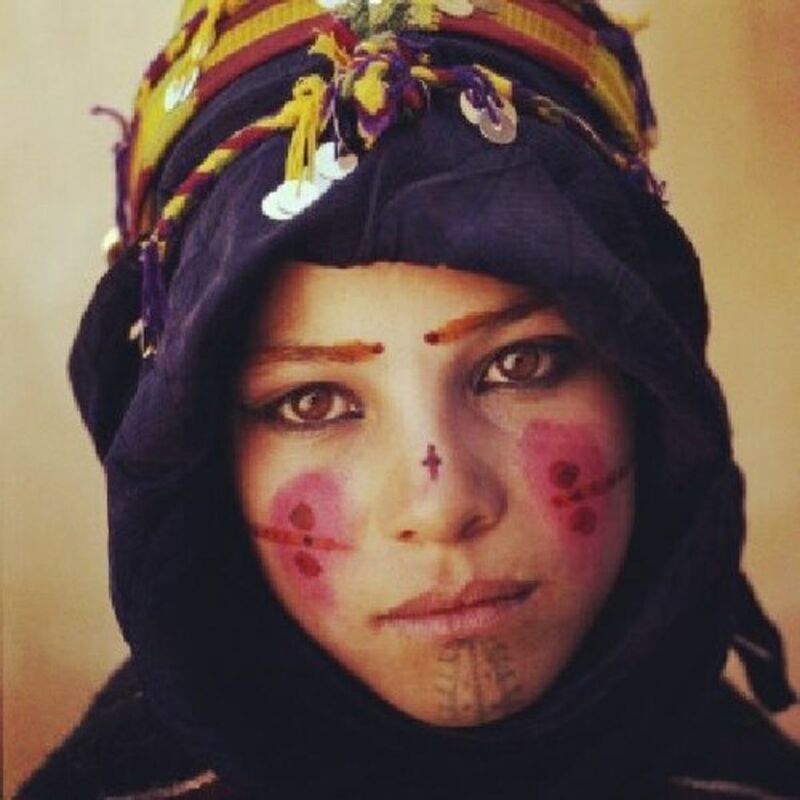 "Tribal markings" on the cheekbones are common, as are bindis. Bindis can be used on the cheekbones or the forehead. Once upon a time, you'd have had to stick the tiny jewels on by hand - but these days they come ready-made, and work in the same way as stick-on temporary tattoos. You can wear a single large bindi in the centre of the forehead, like Carrie in this photo, or you can go for a line of jewels on the forehead to match the line of the eyebrows, which comes from an Indian bridal tradition and is known as a "peer bindi". Another Bindi option which looks spectacular. It's not adhesive so needs to be secured with bobby pins to the hair. Fantastic article! The eye makeup video was great, too. I always have trouble with my eyes! helpful article thx for the infos ..
Love the look of the makeup and the vid was so helpful! Thanks for an informative hub! I totally enjoyed this Hub Marisa. I don't think I'll try the makeup though. Marisa Wright, Interesting hub! Great makeup lesson... Thank you for sharing, Peace & Blessings! What a great Hub...and makeup lesson! I looove that eye makeup tutorial!! Thanks! !